Kitchen and Residential Design: Reader question: Will this work? Help! I'm still on the hunt for accessories to put in my living room. Will this work? 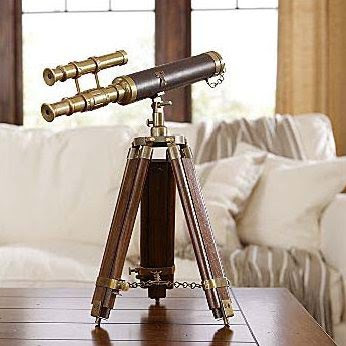 I followed the link you sent me for that telescope and it's not even a functioning telescope. Why would you put something like that in this room? It would make some kind of sense if you had an interest in astronomy. If that were true though, why not get one that works? Do me a favor and never buy another purposeless accessory. Don't buy cheap junk to add "interest" to a room. Ever. All it does is add to the pile of junk that you will end up throwing away eventually. Until it gets to that point though, it will be one more useless thing to dust. Your home should look like you. The stuff lying about should relate to your life and have some meaning for you. Buying stuff for the sake of accessorizing is how you decorate for a magazine spread, it's not how you make a house a home. Accessorize with things that reflect your interests, your loves and your passions. Are you a reader? Then put a book case full of the greatest books you've ever read in your room. Are you a photographer? Set an arrangement of antique cameras on that mantle. Have you been to interesting places? Buy a couple of things that remind you of the places you've been. Hang and arrange an assortment of photographs that tell the story of your life and the lives of the people you love. You home is the one chance in life you get to be the star of your own show. Don't share the spotlight with the junk aisle of T.J. Maxx and Marshall's. In the meantime, I'd suggest you invest in some paint and an area rug. 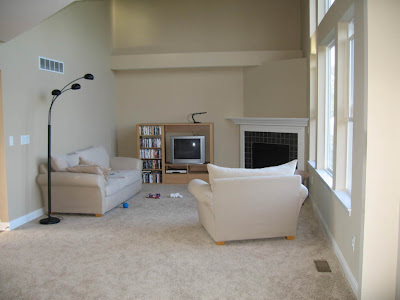 Move that black floor lamp out of the middle of the room. Get some end tables and a coffee table. Set lamps on the end tables. If you're feeling spendy and adventurous, get rid of the sofa and chair set and buy a well-made sofa and a chair or two that coordinate with it but don't match it. Hang some art on your walls. Is this starting to feel overwhelming? I don't mean it to be, but putting together a living room requires a bit of planning. Just adding a bunch of disparate stuff will lead you nowhere fast. Think it through before you spend a dime and then execute your plan. Remember, no junk! Still overwhelmed? Hire a designer. In the hands of a good designer, you will spend no more money than you would without one and the whole thing will come together in a matter of weeks. Awww heck, you can even hire me. When I think of the rooms I've loved, they were rooms that had everything to do with who lived there. The organist who had giant speakers from his upstairs organ set into the wall of the common room. The professors whose rooms had shelves full of books, art by people they knew, and momentoes of travel. The shells and sand tchotckes my grandma bought after she moved to a condo on the coast. Bingo. I can't stand internalized consumerism --the impulse to make one's home look like a magazine spread, hotel lobby or chi chi store. It makes no sense to me.